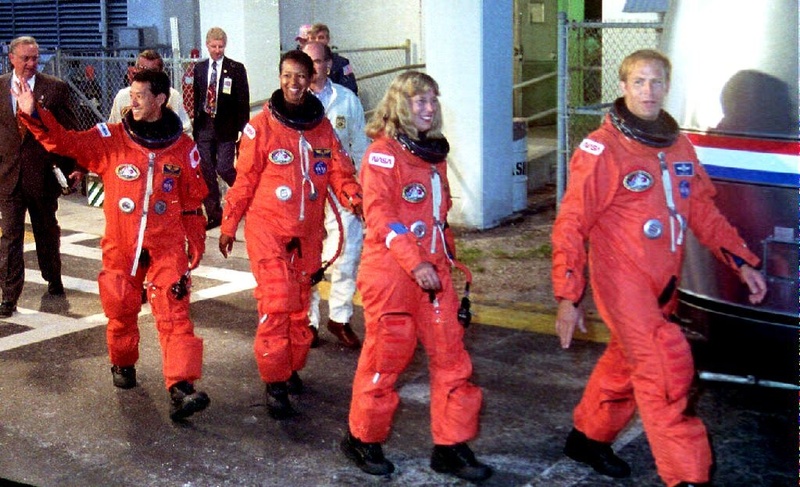 KENNEDY SPACE CENTER, FL – SEPTEMBER 12: Space Shuttle Endeavour crew members (L-R) Mamoru Mohri, Japan’s first astronaut to fly on the space shuttle, Mae Jemison, the first African American woman in space and Jan Davis and Mark Lee, the first married couple to fly together, walk out of the Operations and Checkout Building at the Kennedy Space Center, FL, 12 September 1992. Endeavour is set to launch on a seven-day mission later in the day. Ahead of her Feb. 1 appearance at Forest Lawn, Dr. Mae Jemison, the first woman of color in space, talks about the space shuttle Endeavor, inspiring young minds and figuring out how to send humans to other star systems.